This Self-Dumping Steel Hopper has a low-profile design with a drop-down front for easy shovel loading. The manual hand latches are used to secure the drop-down front. The manual pull cable is used to dump the hopper from the seat of a fork truck. The hopper returns to the upright position when lowered to the ground. 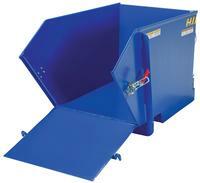 Units feature full 90° dumping, steel construction, and a powder coat blue finish.